Most of these postcards were from group auctions from the community, or from Y!J, and others were from the Southern Island Trading Card set. I had all of these scattered around, until I finally got a cork board for them! 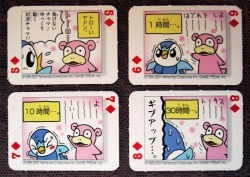 Apparently these are from a magazine? 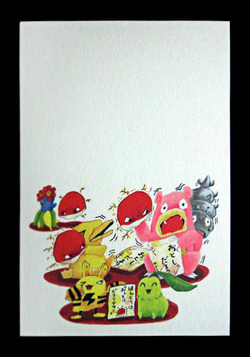 but it came in a set with cute artwork of other Pokemon such as Jynx, Luxio, Drifloon, and Dialga/Palkia. 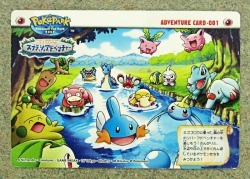 I originally didn't even know what Pokepark was until I noticed a little Slowpoke head in the Mudkip card (from the trading card game) of this series, and then I grew a little more curious! 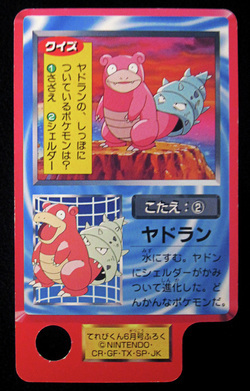 However, I never thought this card had existed, considering card art isn't always cropped from a bigger picture. I didn't think that stuff like this would be printed on a playing card, of all things! But at least there is a rainbow! 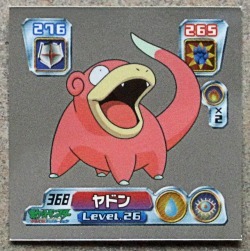 Slowpoke never stops being cute. 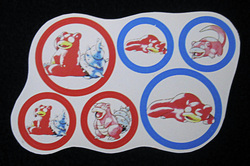 Stickers from a long time ago! 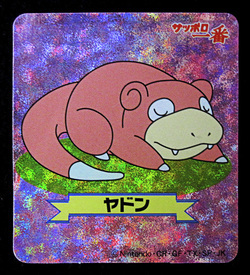 These feature Sugimori's original artwork from way back when..
A peculiar shaped card with a hole on the bottom.. maybe it's supposed to be part of a game? It's also made from pretty thick and good quality paper (reminds me of bristol). 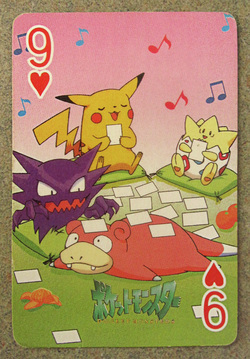 I've never seen this stamp sheet before, and Slowking's got such a cute pose on it too!